I recently sent Grinch Christmas cards to some friends who live in Europe and I soon realized that no one in Europe knows who the Grinch is. Maybe you don’t know either, so let me explain this beloved Christmas story to you, called How the Grinch Stole Christmas! which was written by Theodor "Dr. Seuss" Geisel in 1957. The Grinch is a bitter, bad-tempered creature who lives in a cave on a high mountain near Whoville, a town of Christmas-loving Whos. 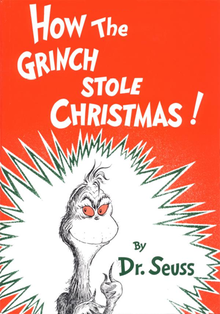 The Grinch, however, hates Christmas so he decides to stop Christmas from coming by stealing the Whos’ presents, trees, and food for their Christmas feast. He disguises himself as Santa Claus and sneaks into their homes and takes everything. On Christmas morning, instead of ruining the Whos’ Christmas, the Grinch sees them smiling and singing, and at that moment the Grinch realizes that there is more to Christmas than just decorations and presents. He brings everything back to Whoville where he is seated in the place of honor at the Whos’ Christmas dinner. For most of the story, the Grinch is really mean. Here is a YouTube video demonstrating that from its 1966 animated special - a classic!